One reason I love this series is because it's good clean fun and a traditional adventure. It's nonstop thrilling action. It doesn't fall prey to modern fantasy trends such as all-consuming romance, vampires, werewolves, and fictional boarding schools. This series finds its roots in Jules Verne, but is still really fun and accessible for people of any age or gender. Each book is its own little adventure and doesn't rely on cliffhangers to guarantee readers will pick up the next one. Oppel has faith that his fun characters will draw readers into the next one. I would be lying if I said this book had any more substance than a good summer blockbuster. Nothing about it is deep, but it doesn't need to be. This series can appeal to anyone. It has humor (a monkey peeing in a stuffy guy's soup is pretty funny no matter how mature you are), edge-of-your-seat action and adventure, breath-taking scenery and fantastical creatures, and even some romance. I really just wish more people knew about this series, because it really is an unassuming gem. Fantastic. This book lives up to the others in the series. I really enjoyed the thought of their Starclimber. Though the marriage stuff between Matt and Kate was like, "Ah! What's gonna happen? WILL SHE REALLY DO IT?" I still was able to keep my vitals mostly normal. I found myself wanting to kick Kate in the pants a few times.Still one of the best fantasy books I've read. This book is amazing--it has everything a bookworm could want. Romance, adventure, spaceships...and monkeys. Matt Cruse and Kate de Vries are about to set off on the ultimate quest...in outer space!Matt Cruse, after weeks of going through grueling outer-space training, desparatly hopes to be the one picked to go into outer space--along with many other young men. Will he be chosen?With a dash of luck, he and Kate clamor aboard the Starclimber, the first space ship.At first he feels very miserable--Kate announces she is engaged, but not to him! ( I was fuming when I read that! )But this is not the time to feel melancholy--for soon huge disaster strikes, and his survival skills are put to the test.This book was an absolutely sensational finish to the Matt Cruse series. I devoured it within three short days. All other events of the day flew by, I was very eager to read this book and find out what happened next!I really liked Matt, as always, and my new favorite character was Tobias. The words with which the author described everything were all rightfully placed. Bravo, Kenneth Oppel for writing this outstanding book!And, thank you Mimi, for giving this to me for my birthday.And, thanks a bunch, Ari, for recommending it so highly! It was a phenomenal read. Five stars! A celestial tower is being built to the heavens in Paris, when a pioneer (Lunardi) decides to launch is own space effort. He recruits 100 candidates from all walks of life to become the first "astralnauts," to man the Starclimber: a spaceship tethered to a 25,000 mile cable. Kate DeVries and another pompous zoologist are chosen to observe, while young Matt Cruse has to undertake a grueling competition to join. Lunardi recruits Matt's mentor, Captain Walken, to lead the expedition. Like the previous two novels, things go badly wrong, there are threats from a religious cult opposed to space exploration, and heroism is needed in order for the crew to make its discoveries and try to return safely back to Earth. As always, Oppel introduces a series of interesting characters, including Shephard, photographer Miss Karr and her per monkey. And, Matt and Kate's relationship is threatened by an engagement proposal from a wealthy suitor. Since I happen to enjoy steampunk fantasy, my biggest disappointment was discovering there are no more books in this series. There is a space race! Did you think it was between the Americans and Russians? Then you'd be mistaken, it’s really between the Canadians and the French. Starclimber starts out a few months after the last one ended. Matt is in Paris with Kate doing what he loves, flying. It seems like it's going pretty well for a not even 18 year old young man. That is until trouble finds Mr. Cruse, which it always does.Matt Cruse has a chance to go into space but first he must prove himself. As he goes into training and testing and so forth. Things with Kate are not at all well. The whole ‘I'm not good enough for her thing’ is still kind of there which annoyed me. It partly has to do with Kate's parents' accepting a poor boy but also Kate herself. Now for the stuff I liked, Matt for starters. A good protagonist is always an excellent sign. He has a little (really minuscule) fault here or there but really an all-around good guy who is trying to follow his dream. Who wouldn't love that? Next is the fact that it all seemed believable. The science that Oppel presents is understandable and well described without being exceedingly boring or completely unbelievable because almost everything that is mentioned we know about. These books have always had a great sense of atmosphere to them and this one was no exception. The whole time I pictured them floating around in space. It’s been so long since I read the last books but the story picks up on what happened fairly well. I forgot about quite a few things like how the books could actually be funny. The professor was definitely the funniest character. It's not a comedy book—it’s not meant to be—but there were a few times that I laughed. It was a thrilling ride through space because, as you can guess, things don't always go according to the plan but if something goes wrong it's always a good idea to have Matt on your side. Lastly, I enjoyed space immensely but I think Matt said it best "I missed my sky." 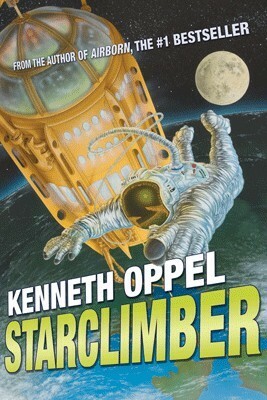 Starclimber by Kenneth Oppel ****4**** "Honestly," she sighed. "I don't know what kind of life we'll have together, with me always flying off in one direction and you in the other. "I smiled. "It's a good thing the world's round," I said. What do you do when you've flown a ship higher than anyone has before? Go higher of course!Matt Cruse and Kate de Vries are both recruited for a mission to outer space. About half of the book takes place on Earth, in preparation for the flight, so if you're only interested in the space part of the book be forewarned. I did not feel that this took away from the story at all, in fact it allowed for us to be introduced to some new characters and time to learn a bit about them before we are sent into space with them for the second half of the book. The final book in the Matt Cruse trilogy was possibly my least favourite of the books (though thats' not saying much as I enjoyed them all). I actually began to find Kate a little bit annoying in this book, not because of her scientific endeavours or her striving for equality. What annoyed me was the way she treated Matt and had to "keep up appearances" for other people. I feel like Kate still has growing up to do and that she is one lucky girl that Matt keeps sticking around.I was so happy to have Captain Walken back in the story as he is one of my favourite characters and I missed him in the second book.In some ways Starclimber felt like it went backwards a step in maturity, mostly thanks to a monkey aboard the space craft who peed in someone's soup and propelled himself through zero gravity by farting. That flaw aside, Mr. Oppel continued with his same writing style and his characters felt stronger than ever. I'm not 100% sure that all of the science is accurate, but as this is an alternate version of Earth it doesn't really matter, nor does it take away too much from the story. It did feel a little bit at times like if something could go wrong it would and they always seem to get out of it, but the authour makes sure you don't feel completely safe as there were accidents and deaths just like the other two books.It was a very good end to the series and I highly recommend reading them all. First off, I'm a big fan of the Matt Cruse trilogy which includes Airborn, Skybreaker, and Starclimber. After reading the first two books, I was extremely excited to finish the series with Starclimber. However at the end, it felt like the book excluded something that made me as a reader to become a little confused and disappointed. For that, I only rated it 3 stars. If you're interested in adventure and romance, this trilogy is definitely something I recommend. Goodreads. Starclimber is one of the best books that i have ever read. I would highly recommend this book to anyone who likes suspense, a good laugh, and a romance. Matt, is one of my favorite characters because his personality is very much like mine, and I like how he keeps a cool head in a suspenseful situation. Kate is my second favorite character, because i like how she always gets what she wants, and she doesn't care who's feelings she hurts in the process. I also like her a lot because of the imagery Matt uses to describe her, from the way her perfume smells, to the way her auburn hair shines when its hit by light. My least favorite character is Sir Hugh, for being such a jerk at times, for always giving all of the credit to himself, and being such a pessimist all of the time. My favorite lines in the book were:"Marry me," I said.She lowered her teacup, shaking slightly, to the saucer. "Aren't you going to get down on one knee? "i got down on one knee and took her hand. "Will you marry me Kate? ""You can't propose properly without a ring," she said.I reached into my pocket and took out James Sanderson's ring, which I'd picked up off the floor of the Starclimber after we'd crash-landed. "That's a nice-looking ring." said Kate with a grin. "Cost a fortune," I said. "And now, for the third time. Kate de Vries, will you marry me? "She leaned forward and took my face in her hands and kissed me. "Yes," she said. "Yes, and yes, and yes. But it will be terrible.""Probably." i agreed. "Honestly," she sighed, "I don't know what kind of life we'll have together, with me always flying off in one direction and you in the other. "I smiled. "It's a good thing the world's round," I said. The Starclimber never got boring for me, the romantic aspect of the book, mixed with the constant imagery that focused on every detail that helped understand the authors point of view.I was really not able to predict the ending of the book, i thought Kate was going to end up marrying James Sanderson, and Mat was going to end up heartbroken. The emotions this book brought out in me made me want to keep reading. It feels weird to say this, but i fell in love with Kate's character right from the beginning. I also felt very sad in the book when the main character would feel betrayed by Kate. If this book was made into a movie, I would definitely want Tom Cruise to be the main character, Matt. I think i would choose Kate Mara to be Kate. Throughout the whole book, i imagined them as the characters. Reviewed by LaLeesha Haynes for TeensReadToo.comSTARCLIMBER is the sequel to Oppel's AIRBORN and SKYBREAKER. This was a fantastic science fiction book for young adults, and will follow in their path of award-winning writing. Matt is an accomplished young man who has many incredible opportunities to prove himself as he climbs out of his childhood. Kate is a feisty young woman with her sights set on a future filled with women's liberation and scientific research. Together, they meet their newest challenge of being the first to ride the Starclimber into space. They are headed to a world of life-threatening new discoveries about space, and new discoveries about themselves as they soar into adulthood. With new creatures and an "elevator" into space, our main characters seek to meet their new expectations and out-of-this-world challenges. The book was packed with nail-biting adventures that are bound to keep readers' interest. It was a fabulous story, and I would suggest it to any young man or woman who likes to read about worlds, not too unlike their own, and young people who are accomplishing what seems like the impossible. This is the third book in Oppel's "Airborn" series. This book was a fun read, but I thought the first two were superior. Fans of the fast-paced, near non-stop action of the first two might find the pacing slow. Personally, I thought the pacing was fine; it was slower and more deliberate, and got more into the relationships and interactions, especially between Matt and Kate. I also liked how some things which seemed inconsequential in the beginning turned out to be important at the end. In this third installment, both Matt and Kate are invited to become astralnauts on the Starclimber, which will be the first vessel in space. Much of the first half of the book covers the training Matt goes through with the other potential candidates. There are some good, laugh-out-loud moments, such as Sir Hugh's trying to upstage Kate during her lecture. The second half of the book has more action than the first half. The ending and resolution between Matt and Kate was a bit surprising. I guess the biggest stretch was the civilian crew. Some members (well, one in particular) should not have been on there, and it felt a bit contrived. But if you are willing to check that at the door, this story is a fun ride. OMGS THIS BOOK. I started reading this trilogy when I was ten, and now, 6 years later have finally finished it. WHAT TOOK YOU SO LONG?! you shriek. I actually had no idea that there were two other books in the series, which is why I've only just finished the last book. Anyway, on to the loves and non-loves of this book.LOVES:- The way Kenneth Oppel describes outer space. IT'S SO AWESOME AND I CAN'T EVEN(have I ever mentioned that I LOVE books where the characters give long descriptions of outer space-preferably while in space- ?? )- MY OTP IS GETTING MARRIED. #ALLTHEHAPPINESS-THE SPACE ANIMALS. -everything basically.-Miss Karr and her wonderful monkey.NON LOVES:-Kate was a bit....annoying? But then Kate has been slightly annoying since book 1, so I don't think this really counts. It's just the way she is.- Shepperd dying. Honestly, I didn't like him, but I didn't want him dying..not like that. - Sir Hugh. That man is such a jerk face. UGH.Anyways, I ADORED this book, and it was a very satisfying conclusion to the trilogy that got me into YA books. It finally happened. I've hit a reading slump. This is the only book I've finished in the past five days, and thank goodness I really liked it!Earlier in July I read the second book in this series, Skybreaker, and was pleasantly surprised by it, and when I saw this final book at the library it called to me.This is such a fun steampunk/alternate early 20th century story, and in this installment, Canada is at the front of the space race! I'm a sucker for books set in Canada, or featuring Canadians, because, well, I am one. And this one is even by a Canadian who isn't from Ontario! WHAT!? Other places exist?Kenneth Oppel is a wonderful writer, and because I finished this book and still felt like I didn't want to read anything else ever, I picked up another book by him, The Boundless, to help me push through this slump! A terrific conclusion to the Matt Cruse series. This one features Matt and Kate de Vries on a mission to outer space. Believe it or not (and some of it surely is unrealistic but fun), the StarClimber is a space ship that can travel 25,000 miles from the Earth. This is an exciting adventure with clever characters, minor mishaps, major screwups and all around good fun. I loved that Matt finally got his HEA with Ms. de Vries (who I honestly wasn't sure about all the way up until the final chapter). I look forward to investigating Mr. Oppel's other books. Hope there are more stories to come of Matt and Kate and their adventures. I think this series would have been a cult classic had it been written decades ago. Really enjoyed it. I was afraid this book might not live up to the first two in the series, and unfortunately I was right - although it's certainly not for lack of trying on Mr. Oppel's part. He has managed to combine pieces of The Right Stuff, Apollo 13, 20,000 Leagues Under the Sea, religious fanaticism, and a hint of the Pink Panther. Having taken us on swashbuckling adventures aboard a giant dirigible and a high-altitude plane, there was no place else for intrepid hero Matt Cruse to go but to the stars. In this steampunk-lite series, it is the early 1900s. A massive rod has been extended 20,000 miles into outer space and a crew is being put together to make the first space voyage to see what's out there. Matt is among 100 young men who try for one of the spots on the crew. His secret girlfriend, the very wealthy Kate, has already been asked to join the expedition because of the discoveries she made in their first two adventures. There are plenty of tense moments and close calls as Matt works mightily to save the day and win the girl - who shows up the launch with a surprise fiancé. The problem is that this is something we all know at least something about. It's just a little too hard to wrap your head around the first crew into outer space being made up of extremely young people who have had only several weeks of training and a group of scientists who have had absolutely no training at all. But the biggest problem is Kate. You just want to slap Matt and say, "Dude, what are you thinking? She's a selfish, self-centered, narcissistic PITA, who will step on anyone--including you--to get what she wants." Instead of reeling Kate in and softening her up a bit, Oppel takes her in the opposite direction, where she goes from being exasperating to being downright dislikable. Matt deserves better. One other reason to deduct points from this book: Oppel leaves a major plot thread dangling, and since this is the last book in the series, it doesn't look like we'll be getting back to it. As with the first two books in the series, this is a full cast audio production, and it is magnificent. All the voices are wonderfully done. Honestly, each book in this series just keeps getting better! They're fast-paced, thrilling air adventures (that admittedly follow eerily similar plotlines to each other, but shhh! ), and yet for all the action, there's plenty of poignant moments to be had too. I actually had tears in my eyes when Sheperd's line broke and he drifted away to a lonely death in space - and I didn't even like the man! And Matt finding out he hadn't made the space-trip, and that Kate was engaged - oh, and the bit where he realised just how selfish Kate was, yet he still loved her despite her faults! (*Searches in pockets for hanky*) I also noticed while reading, the knack Oppel has for believable dialogue, tart humour, and writing suspenseful scenes - these scenes were the ones that had me all wound up and nervous, and skipping ahead paragraphs just to see how the situation would turn out before going back and picking up on the middle bits I'd missed out on. I'm not sure if any of the 'science' is plausible, but hey, it impressed me (although I am of a decidedly unscientific mind), and I got right into it. Fun stuff. Disclaimer: I love Kenneth Oppel. This is not my favourite of his books, though. It's still a great adventure story, set as it is in a parallel universe of steampunk space travel. (You heard me.) If you're willing to overlook a few contrived plot devices and a couple of elements that feel recycled from the first two books in this series, then it's fabulous fun.Matt and Kate are back, joined by a particularly colourful cast of characters. I particularly enjoyed Evelyn Karr, obviously the parallel-universe version ofEmily Carr, who is all sorts of fun. Dr. Turgenev the scientist is wonderfully quirky, so much so that I felt almost compensated for this book's lack of the flashy and tempermental Chef Vlad (my favourite minor character of the series)... but then my dreams came true and Vlad appeared too! For all that I don't feel this book is on the same level as some of Oppel's other works (Silverwing, Airborn, etc. ), I still stayed up far too late reading it. Make of that what you will. From the sky to the stratosphere and finally to the heights of space itself, this immensely satisfying conclusion to the Airborn trilogy did the whole series justice.Matt Cruse, now commander of his own small cargo airship, thinks his life is running along fine. But all at once, everything seems to go wrong. A group of terrorists attack one of France's greatest projects; a huge tower to the stars. One of Matt's own crewmen turns traitor on him. And his girlfriend, the bright and lovely heiress, Kate, is being pressured to marry by her parents.The only salvation comes when Matt is chosen as part of another special mission; a secret Canadian operation that has built an elevator into space called the Starclimber. Navigating a difficult astronaut training regimen and making new friends, Matt is thrilled at the chance to go higher than ever before. Adventure, conflict, strange creatures, romance, and humor can all be found in this final, epic journey into the sky. And I was thouroughly satisfied, but still sad, when I left Matt and Kate at last. I enjoyed the first in the series and the second was rocky but had some really interesting moments.... but I really didn't care for this one. I do respect the painstaking care that the author put into making this alternative steampunk-ish space exploration plausible. However it felt like he just borrowed heavily from deepwater exploration, down to the creatures and space fauna, without really putting his own spin on it. Also the two ostensible heroes, Kate and Matt were just awful to be around for 90% of the book. Both of them. UGH. It was so bad that I started feeling sorry for the character that was clearly set up to be somewhat of a bad guy. I did like that the author fleshed out the bad guys in ways that was more dimensional than just "a jerk because secretly he just wants to be loved" and cliches like that. That is why this is a 2 star review and not a 1 star. But when I put down the book I was just annoyed and somewhat relieved that I didn't have to spend any more time with Matt and Kate. And that's not a good thing. The third installment of the Airborn series does not disapoint. Matt and Kate are back in another thrilling adventure. I could never get tierd reading about their adventures. This one has a lot of the same elements that I loved in the first two books. I love these characters and the amazing alternate history that Oppel has created. I was happy to see some old favorites back again too, like Captain Walken and Chef Vlad. The plot is full of action and conflicts from the begining as Matt faces terrorists and must compete with 100 others for a spot aboard the Starclimber, an elevator to the stars (ok the elevator to outerspace is a bit of a strech but if Matt is on board I'm sold).The action is non-stop (as always) with Kate engaged to someone else, strange other worldly creatures, daring repairs in space, and an Apollo 13-like re-entry. Loved the ending.Ultimately, I think I like Matt better onboard his airship and love his passion for that mode of transportation. I am keeping my fingers crossed for more books. i loved this book. not as much as skybreaker though. the engagement at the end is like agggg what happens next!!!!!!!! hope there is a 4th book (please ken oppel!! )i read this book in a day and a half.its funny because people give my a weird look when i said that. i dont really get it because its only like 360ish pages. which is really not that long.the only thing that i dont like in the book, that mr.oppel could do in his NEXT book, is really have kate fail. it might sound mean but kate is too good at every thing she trys. i want her to be bad at SOMETHING!! I have very much enjoyed this series (Airborn, Skybreaker, and now Starclimber)and was overjoyed to find the third wondrous installment the other day. I think it's the best one so far. I was very happy with the ending, and although there is not as much man vs. man conflict in the plot, it is still as gripping as any other in the series. I am a big fan of Kenneth Oppel, and I highly reccomend this series, or else the Silverwing Saga. Enjoy! I wish there was just a bit more at the end. I would have liked to have seen their homecoming. I am amazed by all the scientific research that had to have gone into writing this and also very grateful for it because it makes the book that much more real and the fantasy portions seem so much more believable. A good ending to a good series. It's finally here! Or at least it will be by February 24th. The 3rd book in the Airborn series. Our pilot in training Matt Cruse is paired again with heiress Kate DeVries as they train to be the first in space. Fast paced action combined with Jules Verne imagination make this a great read for young adults. Kenneth Oppel - I was born in 1967 in Port Alberni, a mill town on Vancouver Island, British Columbia but spent the bulk of my childhood in Victoria, B.C. and on the opposite coast, in Halifax, Nova ScotiaAt around twelve I decided I wanted to be a writer (this came after deciding I wanted to be a scientist, and then an architect). I started out writing sci-fi epics (my Star Wars phase) then went on to swords and sorcery tales (my Dungeons and Dragons phase) and then, during the summer holiday when I was fourteen, started on a humorous story about a boy addicted to video games (written, of course, during my video game phase). It turned out to be quite a long story, really a short novel, and I rewrote it the next summer. We had a family friend who knew Roald Dahl - one of my favourite authors - and this friend offered to show Dahl my story. I was paralysed with excitement. I never heard back from Roald Dahl directly, but he read my story, and liked it enough to pass on to his own literary agent. I got a letter from them, saying they wanted to take me on, and try to sell my story. And they did.